There is no debate that true success comes from hard work, perseverance and skill. Success comes to those who rise early every morning, dedicated and committed towards working on their envisioned goals. However, a key secret in success is the importance of thank you notes. People are accustomed to solely working electronically and quickly shooting out an email after meeting someone or being interviewed. Some individuals do not even send thank you notes at all, so distinguish yourself from other experienced candidates with a handwritten personal thank you note. Follow these three easy steps to blow away your competition and present yourself as the remarkable and qualified young woman you are. 1. Act Quickly: College women should always have a fresh box of thank you cards, envelopes, stamps and a high quality black ink pen. Custom cards with either your monogram or even photograph are effective in reminding the interviewer of just how great and personable you are. Keeping these materials on hand prepares you to write a note as soon as possible, preferably within 24 hours of the interview. 2. 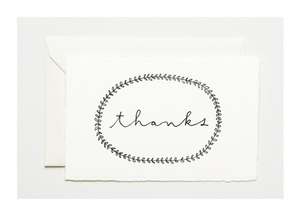 Write Short & Simple: Thank you notes are meant to convey a sense of genuine gratitude in just a few short sentences. Be sure to repeat why you are the ideal candidate, what specific contributions you would bring to the company and how enthusiastic you are about the interview opportunity. You can also use this chance to include anything else you believe is relevant and important for the interviewer to remember and grant you a second round of interviews. 3. Edit and Proof: Read your letter out loud a few times scrutinizing it for spelling mistakes, grammatical errors and general flow. You do not want to ruin a beautiful, handwritten gesture with proofreading mistakes that could cost you the job. If it helps and you have the time, show it to a trusted friend or family member to proof it for you. Send an edited, short thank you card within 24 hours and (hopefully) reap the rewards. Individuals, especially interviewers, rarely receive these anymore, and it is certain to make a lasting impression when comparing you to other knowledgeable contenders. And most importantly, you present yourself as the polished and refined young woman you are.